The name Rolex is recognized around the world. It has become an icon of beauty, quality, accuracy, style, and taste. While there are other fine manufacturers of timepieces, none has reached this pinnacle of public respect and acclaim. The watches produced by Rolex over the last 100 years are celebrated in this lavishly illustrated classic, now in a revised and expanded third edition. Over 30 newly discovered wristwatches are included in this volume, along with new information and a revised value guide. In addition there are detailed looks at some of Rolex's legendary movements. Dowling and Hess, both acknowledged Rolex authorities, have captured the watches' beauty in color photography and present the most thorough and extensive history written of the company. 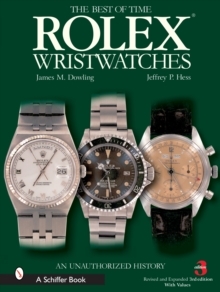 The watches and the extensive information this book offeres to collectors make it a truly useful volume, one that will be cherished by watch lovers around the world.